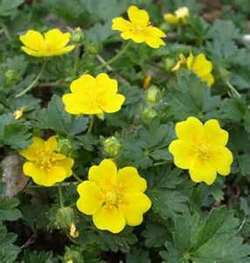 Alpine Cinquefoil is a small mounding ground cover plant with deep green foliage. It will be covered with single, buttercup yellow blossoms from early spring to early summer. It will grow from 2" to 4" tall and 6" to 12" wide. Plant in full sun and well drained soil. Plant Alpine Cinquefoil in a Rock Garden, Moon Garden, in a container, or as ground cover. It will spill over walls and rock plantings. It will become drought tolerant once it is established and is deer resistant. Alpine Cinquefoil is a delightful little carpeting plant, nice for growing between flagstones or in the rock garden.